With all the same benefits of the tried and trusted original Yalelift 360 chain block but with the added benefit of its ATEX rating. 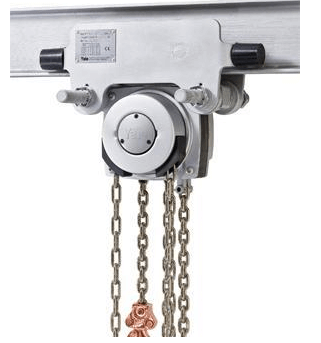 You can be assured of a quality hand chain hoist with the Yalelift 360 atex rated chain hoist. Suitable for potentially explosive environments, these could include. Chemical industries, waste disposal, energy production, gas suppliers, paint factories, pharmaceuticals, refineries, recycling, metal processing and many more. 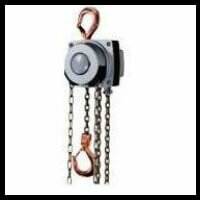 We can supply this Yalelift 360 ATEX rated chain hoist to suit the three main protection classifications. Basic, medium and high. The basic model is explosion protected with a spark resistant coating. The medium version (and higher) has additional copper coated load and suspension hooks. 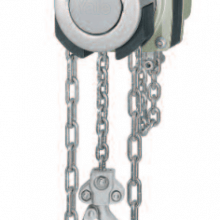 The high rated models have a stainless steel load chain. Main Features and Safety implications. The chain guide on these hoists rotates through 360 degrees. This enables the user to work from any position. This could be in small spaces or even above the load. This patented design enables this manual hoist to be very versatile. This hoist can be used for horizontal pulling and tensioning as well as the standard lifting and lowering applications. This is because it can be operated from the side of the load. One of the main advantages of the design is that the operator does not need to be in the hazard area– near the load. The braking system on the Yalelift 360 ATEX hoist runs quietly. The brake guarantees operational safety. The much improved serviceability is partly due to the exclusion of ratchet pawls. The pawls can be very susceptible to wear and damage. The quality components are additionally zinc plated or yellow- chromate for extra corrosion resistance. Both the gear box and chain guide are virtually completely enclosed. This means that even when operated in extreme conditions the internal gears are well protected. The load chain is of a zinc plated alloy steel, with surface protection. This fulfils current requirements, standards and national regulations. 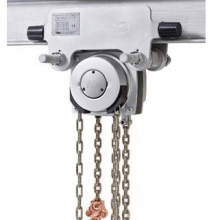 · Hardened load sheave incorporating 4 precision pockets for precise movement of the load chain. · Drop forged, swivel load and suspension hooks with robust safety latches. If you require more information regarding this model or ATEX rating issues in general, please contact us, we are always happy to try to help our customers. "yalelift 360 atex hoist dimensions pdf"